Click on the image to see which airline offers the most legroom. The fight to stop airline seats from shrinking died Thursday on Capitol Hill. The Senate rejected an amendment introduced by Senator Charles Schumer that would have required the Federal Aviation Administration to set a minimum seat size and distance between seat rows on airplanes. The Democrat from New York claimed the distance between airline seats has contracted to around 31 inches from 35 over the years. The average seat size has also shrunk to 17 inches from 18.5 inches. 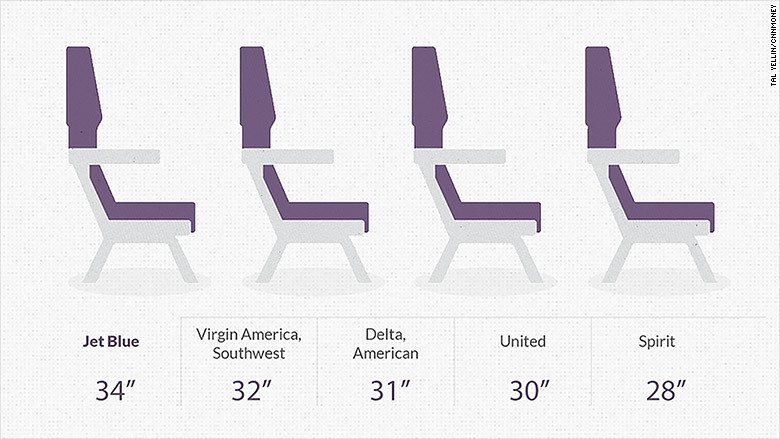 Related: Which airline offers the most legroom? There is no federal mandate that dictates how much space airlines must have between seat rows other than in the exit rows. The amendment, which was attached to a FAA reauthorization bill, failed Thursday 42-54 -- largely along party lines. "Airlines have been cramming consumers into airplanes like sardines and instead of lowering their prices several major airlines went the other direction -- they started charging for the extra inches in legroom that was once considered standard," Schumer said in a statement after Thursday's vote. Shrinking personal space has become a top complaint from fliers. Airline companies and manufactures have been working to upgrade cabins to fit more seats without compromising passenger space. After all, more seats tend to mean higher ticket sales. Schumer blamed airline lobbyists for the defeat, but said he would continue to work to get the legislation passed.